I dont know what compelled me to buy this. My least favorite vegetable is spinach. 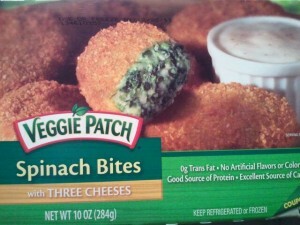 Well, maybe that’s a bit harsh…(or maybe not), either way, I would most likely not ever eat plain spinach on it’s own. SO, perhaps what got me to buy these was the picture on box and the mention of “THREE CHEESES” on the box as well. And the fact that they looked like chicken nuggets didn’t hurt either. SO, into my shopping cart they went, and then into my fridge after I bought them. The other night I got the urge to try something different, so I took these out and popped them into the toaster oven. It said to cook them on 375, but my toaster oven had 350 and 400 as an option. Hmm? 350? or 400? 350 with the possibility of cold spots? Or possible burning/crispy edges with 400? Regardless, I’d rather have crispy edges than soggy cold spots (if that would even happen), so I chose cooking them at 400 degrees F.
Not nearly as plump as they looked on the box, but still pretty yummy looking. I steamed up a bunch of veggies and had 6 of these for a light meal, with some applesauce on the side as well. The outside crust/breading tasted like a mozzarella stick, but these weren’t greasy really at all. The inside was actually surprisingly good. It was cheesy, hearty, and a bit salty. The texture was kind of like a chicken nugget- it was like a spinach/cheese “patty”. 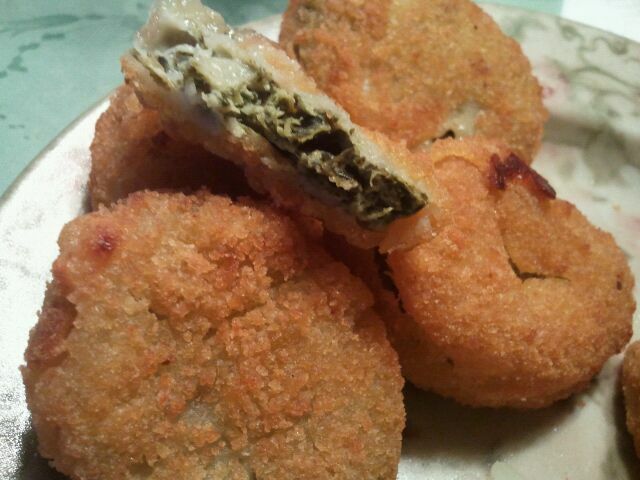 From the picture, it looks like the cheese and the spinach was layered, and it stayed together. No oozing of cheese or anything like that. 3 bites has 150 calories, 8 grams of fat, 16 grams of carbohydrates, 3 grams of fiber, 2 grams of sugar, and 6 grams of protein.